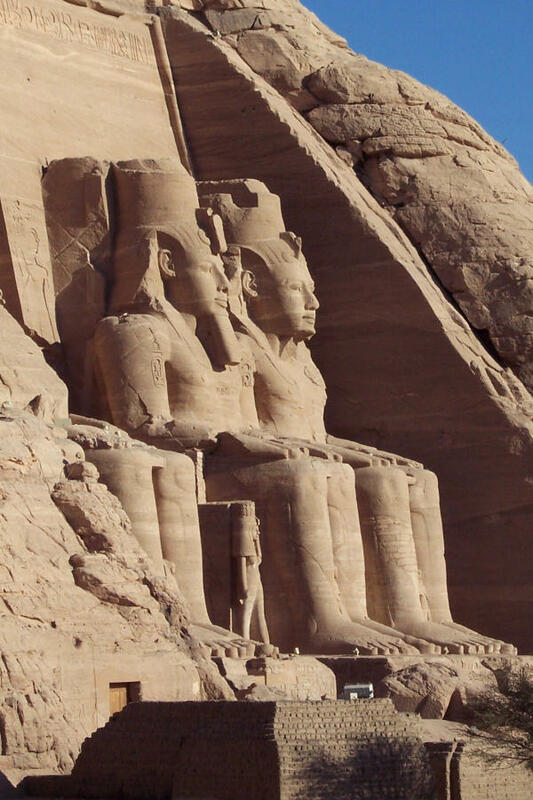 Below are the massive carved statues of Ramesses II at the entrance to what is now known to have been the ancient Short Humour Repository at Abu Simble in southern Egypt. Although discovery of the Rosetta Stone allowed translation of ancient Egyptian hieroglyphic writing in the 19th Century, the original translators failed to recognise the fundamental nature and purpose of the texts which adorned Egyptian temples and tombs. 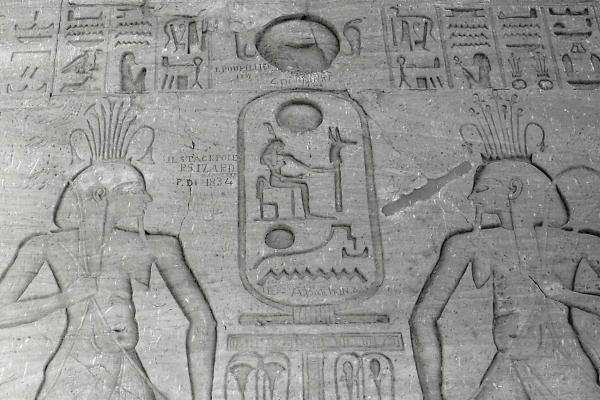 It is now clear that this stone-carved literature exclusively recorded short humorous stories, poems, songs and the like  each of around 500 hieroglyphs. This was not obvious to early scholars because, just as today, the understanding of humour required awareness of nuances in language and the cultural context in which jokes were set. Early translators had simply focussed on the literal meaning of the writings, not expecting them to have humorous content. 1st Slave: The dog of the Pharaoh does not have a nose. 2nd Slave: Does the animal have difficulty in following a scent when hunting? 1st Slave: Yes, it has considerable difficulty in that respect. 1st Slave: The Pharaohs dog has got no nose. 2nd Slave: How does it smell? Tefnut (lion-headed goddess): I saw you with a woman, last evening. Pharaoh: Yes, I went for a walk with the Queen of Egypt. Tefnut (lion-headed goddess): Who was that lady I saw you with last night? Pharaoh: That was no lady; that was my wife. Accurate translation of comic exchanges, such as those above, has allowed humero-archaeologists to confirm that some jokes, including all those found in Christmas crackers, are over four-thousand years older than previously thought. 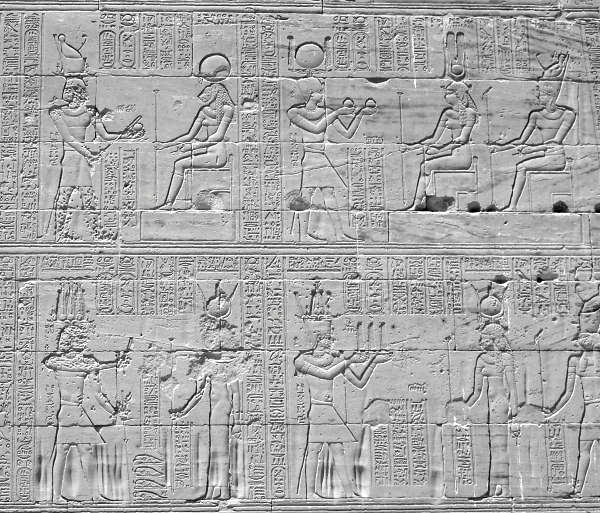 Humorous material was important to the Pharaohs as they believed that during the journey to the Afterlife it was necessary for them to entertain a succession of gods with the performance of comedy routines, culminating in a thirty-minute stand-up slot in front of the Great Sun God, Ra. Short Humour would be collected by priests and inscribed in the fabric of myriad temples along the Nile. Stories intended to be related with a straight face were recorded in the Egyptian Book of the Deadpan. Once the pyramid or tomb of a Pharaoh was complete, he would visit these temples to work-up a series of secret comedy acts. This material would then be depicted within his burial chamber to allow rehearsal prior to his sacred journey. 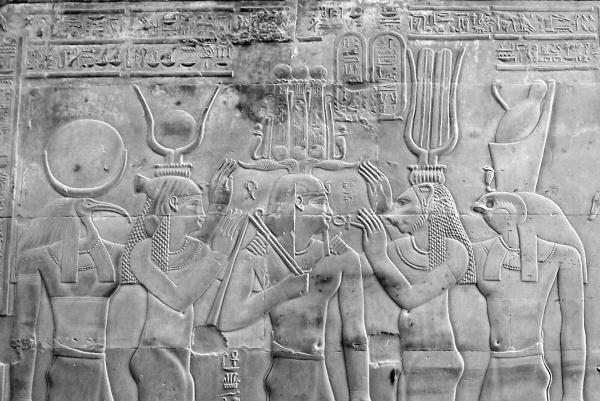 So secret was the routine to be performed before Ra that masons who carved the texts and artists who illustrated them would be killed and buried with the Pharaoh. Much retranslation of hieroglyphic texts remains to be undertaken, and specialists from the Short Humour Site are working closely on this task with the Egyptian Supreme Council of Antiquities. All Photographs © Swan Morrison.